When you collect coins, the ancient ones are a pretty attractive option and, by far, the most popular ones are the Roman Imperial Coins. The first one is how easy you can get these coins. The Roman coins are very easy to find in countries from Europe like Italy, France, Spain, Great Britain, Bulgaria, Romania, Greece, from Asia, like Turkey, Syria, or Africa like Egypt. 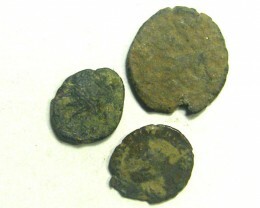 The regions were occupied by the Romans in ancient times and coin finds are numerous and also the collectors’ interest in this domain is large. But if you live in the USA or Australia, finding the coins you need can be hard and usually you must bring them from abroad or, if you buy them from a local market, pay a little bit more, because of their scarcity on the local market. But that is not all. In some cases, you cannot take out from some countries ancient coins or artifacts, because of the laws. Moreover, in some countries, owning these coins is prohibited by law, with some exceptions. So, before you start these collection, find out as much as you can about the opportunities you have or the difficulties you may encounter. After deciding to start a collection and finding a market from where you can buy, you must think what you want to buy. First of all, a collection with all the nominal values. 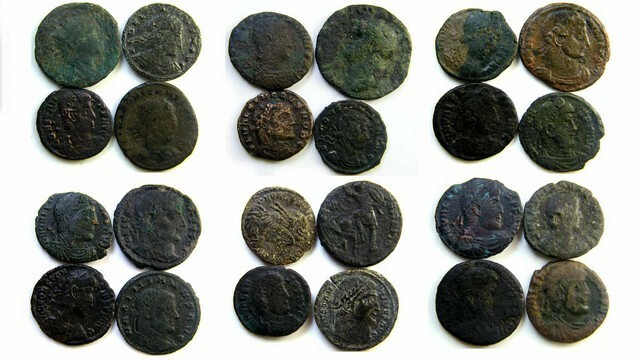 If you try to collect all these coins that circulated from the first century to the second century AD, you will need to find two gold coins, an aureus and a quinarius aureus, two silver ones, the denarius and the quinarius argenteus, and five bronze ones, the sestertius, the dupondius, the as, the semis and the quadrans. But to complete the collection you will need some serious money, finding an aureus below 2000 $ being a real chance (usually this coin is worth 4000-6000 $). A decent denarius can be found from 20 $ to 200 $, and it can be even more expensive if it is a rare type. The sesterius is also a little bit expensive, around 100-200 $, sometimes cheaper or not. The other bronze coins are easy to find. But the sum of money that you are willing to give is not enough. 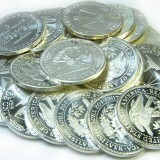 For example, if you live in Germany, it will be pretty easy to find silver or gold coins on the local market. Why? Because the Roman Empire paid to the German populations large sums of money as subsidia, different gifts for different reasons. And the payment was made, of course, in precious metal. But it is hard to find here bronze coins because these were hard to transport, a large number was necessary to make a big sum of money and also because these coins were subsidiary coinage, that means that you need a central authority that will guaranty it’s legal tender. In France for example, you can find nice bronze coins or even silver but gold coins are very rare. Depending on the money you have, you can collect only a particular type of coins. For example silver denarii. The bronze sestetius is also an attractive option, due to its large dimensions (usually 27 gr. and around 25-35 mm) and its beautiful scenes. But even then you will try to find a more particular theme. For example, a coin for each emperors from Augustus to Romulus Augustus (27 BC to 476 AD). But it is hard to find them all, because there are hundreds of them. Also, some are rare, like Otho(69 AD), Vitellius (69 AD), Pescenius Niger(193) and many others but in some cases they are impossible to find, like Julian of Pannonia (285) or Valerius Valens (316). Some collectors try to concentrate on one dynasty like the Julio-Claudian one (14-68, Tiberius, Caligula, Nero) or the Severian one( 193-235, Septimius Severus, Caracalla, Geta, Heliogabalus, Severus Alexander). You can also decide to collect the coins minted for the emperor’s wife, mother, daughter, father and so on. Some people collect these emperors starting from ancient sources. For example, Suetonious Lives of the twelve Caesars , describing the lives from Caesar to Domitian. Another theme of collecting, very popular, is represented by the coins with the emperor on one side and a member of his family on the other. The perfect coin of this type is an aureus minted by Septimius Severus, with a reverse showing the face of Iulia Domna, his wife, and their two children on each side, Caracalla and Geta. The type of Consecratio, types minted for a dead emperor soon after his death, usually showing him carried away by an eagle or on an altar, are also an option. Usually, the Roman coins carry on the reverse gods or goddesses. Some people collect a particular god. For example, the Mother of The Gods, Cybelle, or the goddess of love, Venus, or the god of war, Mars, or the goddess of wisdom, Minerva. If you collect these types, you must know how to identify these gods. Each of them has some particular features. For example, Minerva is always wearing a round shield and a spear and has on her head a helmet. Sometimes she is accompanied by her animal, an owl. The goddess of fortune, Fortuna, is shown with a rudder and a cornucopia, a symbol of wealth. She can sit on a throne or can stand looking on one side. A god can have different names. For example, Mars can be the god of peace, Mars Pacificatori, or the god of victori, Mars Victor, or the god of revenge, Mars Ultor with different images. Usually rare, in some cases the goddess is a personification of a defeated enemy. A woman that appears on the Trajan series of coins with the legend DACIA CAPTA (the conquered Dacia) is the personification of that province. On the reverse military scenes can appear, weapons taken from the prisoners, like a sestertius of Antoninus Pius, showing some ancilla , particular shields. Or maybe scenes with the emperor, in religious moments, like sacrificing before an altar, political ones, speaking in front of the troops (ADLOCVTIO AVGVSTI) or the Senate, or military ones. Another main problem is represented by the fake coins. Ever since the XVI century, making fake coins for profit was profitable business. One of the most famous counterfeit was the german Carl Becker, who lived in the first half of the XIX century. He had a special gift for this job and his creations are considered masterpieces, in some cases hard to identify as fakes. It is also true that today his fakes are considered to be more expensive then the originals but the fake is a fake. Unfortunately, today, some fakes are very dangerous for collectors. The fakes from the Bulgarian school are almost perfect in some cases. Also the Chinese fakes are starting to be more accurate then ever. Only with time and experience, these fakes can be avoided. But in the end, you will decide what you want to collect. And even if you know that the collection will never be finished, as all the coin collections, the satisfaction will still be great when you add a new beautiful piece to it. It is very important for a collector of ancient coins to properly identify the piece that he has. A good and fast identification can help him when he buys that coin and can protect him from possible frauds or misunderstandings. Of course, it is impossible to know all the coins. But knowing a few little things can be very useful. First of all, when you take in your hand a coin, it is very important to know who issued it. For the Roman imperial coins, that person is always the emperor or one of his family members. As every Roman, the emperor has a name that must follow certain rules. The name is made up of 3 parts. Let’s take Caesar for example. His name is Caius Iulius Caesar. Caius is the praenomen, or first name. Iulius is the nomen or nomen gentile, his family’s name, and Caesar is the cognomen or nick name, in this case meaning either the bald or that he was born by caesarean section. The poet’s name, Publius Ovidius Naso follows the same rule, Naso being the cognomen and meaning “big nose”. Sometimes the first name can be abbreviated as C for Caius, P for Publius, Ti for Titus Cn for Cnaeus and so on. Also, the name can carry more then one cognomen. In legal matters, the name also contains another part, the father’s name. This part appears between the nomen and the cognomen and it is accompanied by the formula filius, “the son of…” For example, Caesar’s father was also Caius, so his full name is Caius Iulius Caii filius Caesar. Translated: Caius Julius Caesar, son of Caius. The emperor’s name is basically the same. When Octavian took the supreme power in the Roman State, he changed his name. His official name was from this moment on Imperator Caesar Divi Filius Augustus. Imperator was his first name. It was the name of the function that he had. In modern times it can be assimilated as fieldmarschal althrough in all the modern languages it gave the word “emperor”. This name conferred to a person a high military authority. Caesar was his adoptive father’s cognomen but for Octavian it is his family name, to suggest his close connection with him. Divi Filius means “the son of the divine (Caesar)” and gives him religious authority, as son of a god. Augustus was his cognomen and means at the same time, sacred and authority. All the emperors that came after Augustus kept this formula of the name, adding some more cognomens, usually representing some functions and of course changing the father’s name. In time, the names became more and more complex. For example, an aureus of Trajan has the following legend around the emperor’s head: IMP CAES NERVA TRAIAN AVG GERM. On the other side, the next part is PONT MAX TR POT COS II. CAES is the abbreviation for Caesar. The next part of the name is missing but it can be understood as NERVAE FILIUS, the son of Nerva, his adoptive imperial father. NERVA TRAIAN is Nerva Traianus. The presence of the Traian formula shows that it cannot be only the emperor Nerva. GERM stands for Germanicus, the winner of the German population. These triumphant names are given in the honor of the great imperial victories over barbarian populations. These titles were used by an emperor for imperial propaganda and played the role of cognomen. Also, the abbreviation can appear as DAC, PARTH, SARM, GOTH and so on, for Dacicus, Parthicus, Sarmaticus, Gothicus …. In some cases the formula MAX is added at the end, and means MAXIMUS. For example, Germanicus Maximus means the supreme winner over the Germans. Because this title was given after important battles which were won, their presence or the absence is an important clue in dating the coin more precisely. PONT MAX or sometimes only P M means Pontifex Maximus, supreme priest, an important function. It can only be given to the emperor himself at the beginning of the reign. Even if there are two emperors simultaneously on the throne, only one can be Pontifex Maximus. TR POT is the abbreviation for Tribunicia Potestatis, a function that means tribune of the people. This is the most important dating detail. Every year, on the 10th of December, the emperor and only he took this function. It is represented on the coin as the first (number I=1 is omitted yet from II=2 onward). COS II means Consulus 2 or Consul bis, that is “consul for the second time” and it means that he was or is consul for the second time. It is also a dating clue, because Trajan was consul 7 times. This function is one of the most important, being assimilated with the modern prime minister function. Other 2 names and abbreviations are missing from this coin. The first one is P P or pater patriae, the father of the country. It always appears at the end of the name and it must not be taken by mistake as P M.
Another important function is CENS or Censor, responsible with the morales. Every 5 years, the censor ordered a population numbering and also studied the structure of the Senate. If he considered necessary he appointed new members or put out old ones for morality problems. Because it was a function that gave great power, it was almost exclusively used by the emperor. Sometimes the word PERPETUUS is added, this meaning that he is “forever Censor”. In time, the legend became more complex or more simplified. Also, the letters were changed. For example, in the third century the form IMP was sometimes written IIIIIP because of the method of writing the M. Moreover, almost all the emperors were using the name Marcus Aurelius Antoninus with the imperial names and confusion can happen. How to identify the Roman coins. The dating. 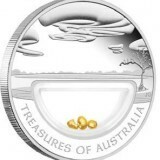 After you find out the coin’s issuer, you must find as much information as you need about the exact minting date. The emperor’s reign years are fine to start with, but this is only general. The emperor’s official name has enough clues to help you. In some cases you can figure out even the month. In other cases, you can only find out a certain period of time, shorter then the reign years; however, this is better than nothing. Every part of the emperor’s name is taken by him in specific events. The presence or the absence of one name is a clue. Let’s take one silver denarius of Septimius Severus, 193-211. On one side, the head and the legend L SEPT SEV PERT AVG IMP X. on the other side P M TR P V COS II P P.
The name starts with the formula IMP CAES, but here it can be understood without being written. The letter L is the standard abbreviation for Lucius, the first name of the emperor and SEPT SEV for Septimius Severus. PERT is the name of the adoptive father, Pertinax, emperor for 63 days in 193. AVG means Augustus and it represents his title taken in 193, at the beginning of his reign. IMP has an interesting situation, it means Imperator. Imperator was his first name but it also indicates a function, similar to the general (or better said fieldmarschal), a glorious title given to a soldier after a great victory. The first Imperial title is taken at the moment of rising to power and after this moment it can be given frequently. Septimius tenth imperial title was taken in 197 and before 198, his eleventh imperial title. PM means Pontifex Maximus and it is a title took in 193 and kept until his death in 211. TR P V means his fifth tribunate, started at 10 december 196 and ended at 9 december 197. The next day he started his sixth tribunate. COS II means consul for the second time. The first one took place in 194 (actually in year 189 he was consul suffectus or temporary, a secondary function) and the second in 194. The third started in the year 202 so by this title, the coin is minted between 1 january 194 and 31 december 201. PP stands for Pater Patriae, the father of the country, and it is taken in 193. All this information gives a precise date. This coin was minted somewhere between 197 and 198. As I said, the absence of some elements can be a clue. For example, Septimius took the title Parthicus in 198. The absence of this title means that the coin is minted before 198. Or after 202, his name starts as SEVERVS PIVS AVG…. that can also be a dating clue. From Augustus to Trajan, no emperors have a beard. Except Nero who appears with whiskers. The first century coins, especially the ones which date from 14-69 have a head that has a long neck. Moreover, they don’t have any kind of clothes. The Flavian dynasty (69-98, Vespasian, Titus, Domitian) is easy to identify by the round heads, with wrinkles. From Trajan onwards, the emperor usually has a cloth or military armour. From Hadrian onwards, most of the emperors have a beard. From Augustus to Diocletian 27 BC-286 AD. It is very important that after you properly identify the issuer of the coin and you date it correctly, to identify the nominal of the coin. 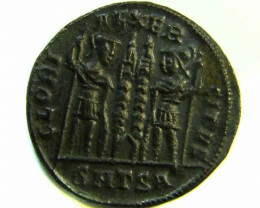 Unlike the modern times, when the value of the coin is clearly stated on it, in ancient times, the value was known by the weight and the diameter of the coin. Aureus - a coin made from gold, as its name states. It was first minted around 210 BC but it was an exotic coin, with a high value. The republican pieces are usually rare. From Augustus, it was a gold coin of high purity, around 23 k, and a weight of 7.9-8 gr. and a diameter of 19-21 mm. It had a value of 25 silver denarius. On one side, the head of the emperor appears or, more rarely, a member of his family. On the other side, different scenes are presented. From the time of Nero, the weight drops from 64 AD to around 7.6-7,7 gr. and from the second century AD to around 22 k of gold. From the time of Septimius Severus and his son Caracalla the weight was around 6,5-7 gr. In the third century the weight was very different from emperor to emperor, in the context of the crisis. The weight went from 3,5 to 5,5 gr. Diocletian also minted some aureus around 5,4 gr. The aureus is a very rare coin. 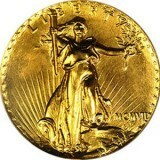 A normal value for this coin is around 3000-4000 $. In some cases, like a rare emperor or a rare reverse, the coin can easily go over 10.000 $. Usually, these coins have circulated quite a bit and a good coin is not rare, like a VF. A UNC, however, is very hard to find. Quinarius aureus - the golden half. It represented ½ of an aureus and also half of its weight. It is a rare coin, seldom seen in circulation. It was minted on rare occasions. It weights around 4 gr. and has a similar look as the aureus. From the third century, because of the more and more light aureus, it disappeared from circulation. These coins are very rare and expensive, even more than the aureus. Denarius is the standard coin in the roman system. It is made from silver and that’s why it is sometimes named as denarius argenteus. It values 1/25 from a gold aureus and 16 asses. In the republican time, it was first minted around 210 BC. In the beginning, it valued only 10 bronze asses, thus named denarius (from decem, which means ten). It weighed around 4,4 gr. in the beginning. Augustus minted denarius at around 3,9 gr. From 64 AD, Nero minted them around 3,5 gr. 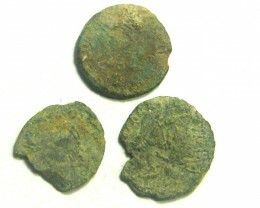 In the second century, the coin dropped to around 2,5-3,3 gr but pieces of 3,8 are not unusual. The diameter was around 17-18 mm for the denarius in the first century. At the beginning of the second century, it was around 18-20 mm. Starting with the first part of the reign of Septimius Severus, it was a more thick and small coin, around 15-17 mm but from the second part of the reign, after 202, it became thin and large, around 18-21 mm. The quality of the silver was around 90-93 %, in the beginning. From the reign of Trajan, 98-117, it was around 70-80 %. Septimius Severus minted denarius at around 50-70 %. Sometimes, these coins were made from bronze and only silver plated. In the third century, in the context of inflation, its value dropped and after 238 it can rarely be seen in circulation. 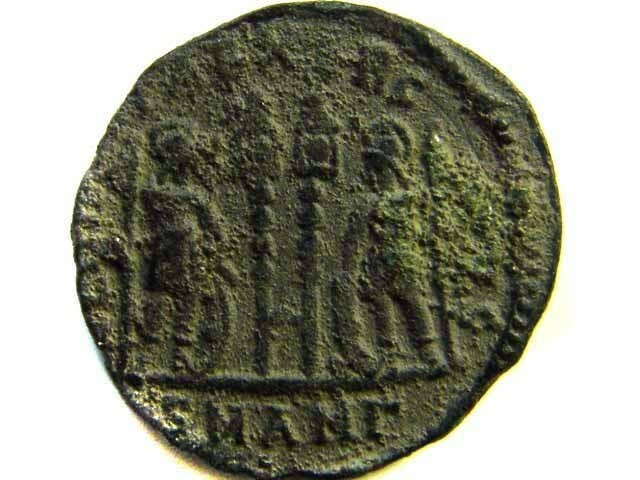 This coin is one of the most common for the Roman Empire. It was minted in large quantities. Most of them are valued today at 20-50 $ a pieces of medium condition and not so rare. In some cases, for example a rare emperor or rare reverse can have a high value, around 1000 $ or even higher. Usually the Consecratio theme or the family coins, with more than one member are rare. Also, this coin is hard to find in decent condition. Even a VF is sometimes hard to find, because these coin circulated for a long period of time. A XF is almost a dream. Quinarius argenteus represents half a denarius. It is made from silver and has a weight of half this coin, around 1,2-1,7 gr. 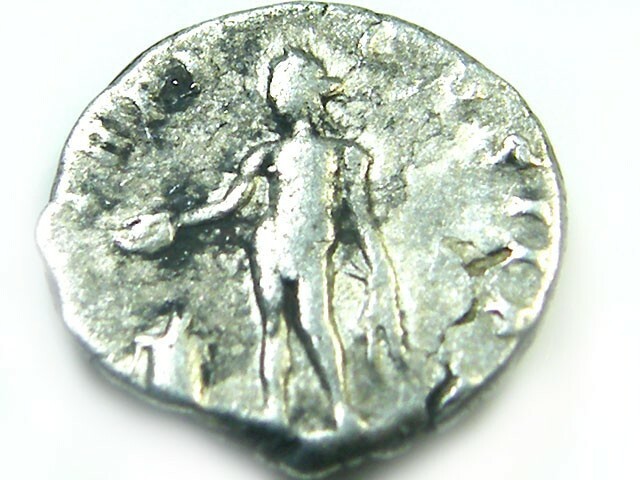 It is similar to the denarius. It is a very rare coin, hard to find and usually expensive. 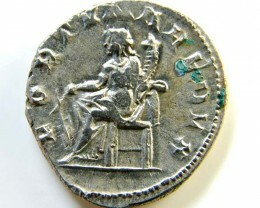 Antoninianus has a value of 2 denarius. It was introduced in 215 and as a distinctive feature, the emperor’s head has a radiate crown, while the empress has a lunar crescent over her shoulders. It had a diameter of 23-25 mm and initially a weight of 5,5. The silver content was only 50 %. After 238, it lost weight, to around 4,5. After 251 it became a bronze coin, with only 3-5 % silver. Also, it was light, around 3 gr. Even so, light pieces can be found. 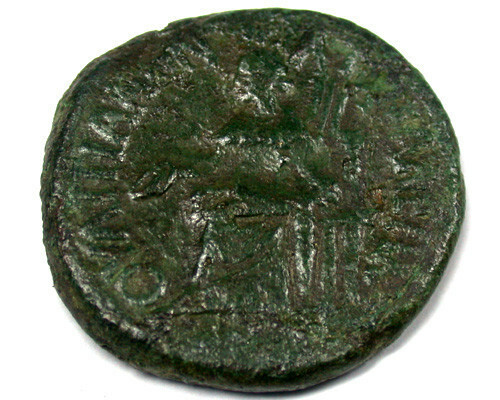 Aurelianus, 270-275, tried to improve this coin but failed. It disappeared from circulation after Diocletian reform. Sestertius is a quarter of a denarius. It was originally made from silver but Augustus mints this coin in bronze. It usually bears the mark HS as a symbol of value. It has a diameter of 25-40 mm, and a weight of 25-27 gr. Usually, it has superb scenes on the back, because of the large available space. In the third century, it started to lose value and weight, after the second half of the century it disappeared from the market. Usually, this coin is hard to find. A fine example can go from 100 to 300 $. Cheaper pieces can be found. Also, depending on the back, they can be much more expensive. Some of the most spectacular pieces are the ones with buildings. For example the one dedicated by Nero in honour of his Ostia harbour. 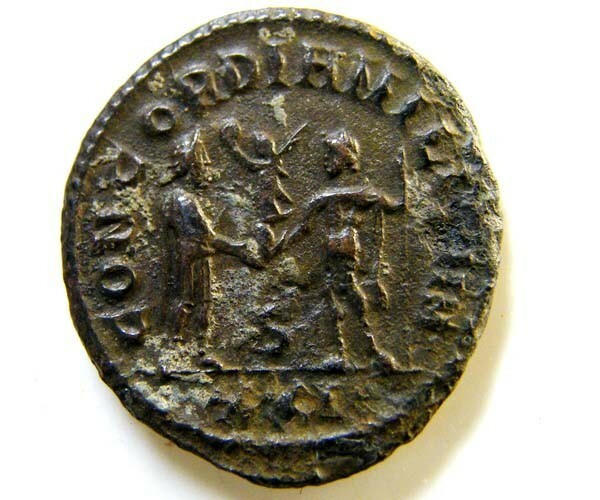 Dupondius was a coin made from orichalcum, a bronze alloy. It weights around 13 gr. and the diameter can vary in size. It was equal to ½ sestertius or two asses. After 64, its distinctive mark was the radiate crown that stands on the emperor’s head. These coins are scarce, yet decent pieces can be found. As is the basis of the Roman currency. It was a unit made from bronze. During the republican time, it had different weights, from 1,5 kg (aes rude), being minted as ingots. It soon lost its weight and became a coin (aes grave) with a weight of 327 gr. In 89 BC, the weight was considered equal to one ounce (aes uncial). Augustus minted asses at around 10-11 gr. It was made of bronze. The first century pieces are simple and inexpressive but usually rare. 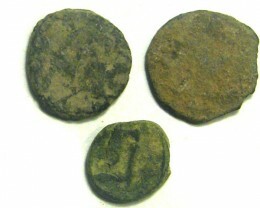 The second and third century pieces are common. The price of this coin can vary. It is very hard to find a good quality piece. Semis was a measure unit ever since the republican times. It is a rare coin, very rarely minted. It was half of an as, as the name states (semis=half). Quadrans was ¼ of an as, as the name states (quadrans=quarter). Also a rare coin. Was minted ever since republican times. In the imperial time, it was rarely minted. 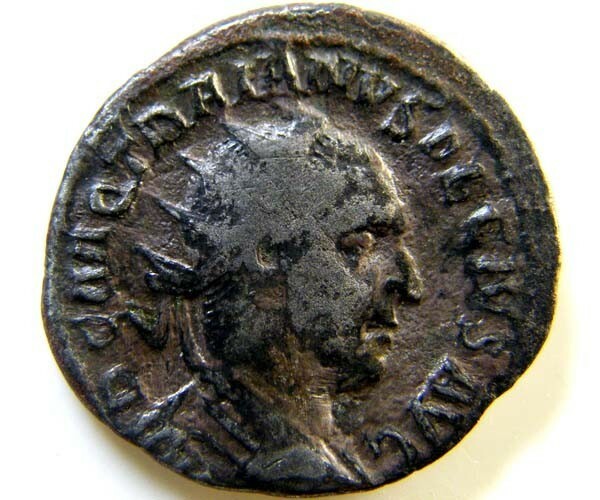 Lots of collectors have the tendency to take the fake denarii, made from bronze, as quadrans. The main difference is the style. The quadrans have a slight negligent aspect. 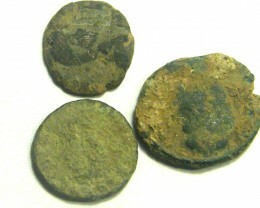 Collecting Ancient Roman Coins Part V- last pagan Emperor.